Professor Balachandar is currently the William F. Powers Professor in the Department of Mechanical and Aerospace Engineering at the University of Florida. From 2005 to 2011, he was the Chairman of the department. Under his leadership, the department grew rapidly from 42 to 54 faculty. He is the inaugural Director of the Herbert Wertheim College of Engineering Institute for Computational Engineering (ICE) and under his leadership the Institute has established the graduate certificate program in Scientific Computing. Professor Balachandar’s expertise is in computational multiphase flow, direct and large eddy simulations of transitional, turbulent flows, and integrated multiphysics simulations of complex problems. He is a fellow of the American Physical Society and the American Society of Mechanical Engineers. Professor Balachandar received the Francois Naftali Frenkiel Award from the American Physical Society Division of Fluid Dynamics in 1996 and the Arnold O. Beckman Award and the University Scholar Award from the University of Illinois. Before joining the University of Florida, Professor Balachandar was a professor in the Department of Theoretical and Applied Mechanics at the University of Illinois at Urbana-Champaign, where he was the co-lead of the Fluids Group and a member of the Science Steering Committee at the DOE ASAP Center for Simulation of Advanced Rockets. This research group included six faculty, seven research scientists, and several graduate and undergraduate students. Many of these staff and students are now employed as researchers at NNSA labs. As the PI, Professor Balachandar will focus on establishing a world-class center for predictive simulations of compressible multiphase turbulence. The research and development at the center will stimulate, benefit from, and leverage the corresponding efforts at the NNSA labs. Educating and training domestic graduate students and research scientists in predictive simulation science using peta and exascale platforms, and their placement at the NNSA labs, will be a singular goal of the center. Professor Haftka is a Distinguished Professor of Mechanical & Aerospace Engineering at the University of Florida. He has initiated a joint PhD degree with a top French university. He was a founding member of the International Society of Structural and Multidisciplinary Optimization, its second president and co-editor of its journal. Professor Haftka’s research is on design under uncertainty and the role of tests and simulations for reducing uncertainty. For managing the computational burden, his team has developed novel ways of combining surrogates (metamodels). He is a fellow of the American Institute of Aeronautics and Astronautics (AIAA) and a recipient of its MDO award. In 2009 he received the Starnes joint award of the AIAA and the American Society of Composites for leadership in Structural Mechanics. Before the University of Florida, Professor Haftka was the Christopher Craft Professor of Aerospace and Ocean Engineering at Virginia Tech. He also spent four years in the aerospace industry, and five years (including summers and sabbaticals) in government labs. Professor Haftka has always put great emphasis on collaborating with peers from academe, government laboratories, and industry. He has written papers with more than 130 peers (excluding students and post-docs). As a Co PI, Professor Haftka will focus on uncertainty quantification, uncertainty reduction and verification and validation (UQ,UR,V&V). He sees the parallels between the physics side and exascale side as a great opportunity for advancing the state of the art in UR and V&V on both sides. This will require all students involved to work together with several advisors– a tradition of Professor Haftka’s group. The five PhD students that he currently directs as chair, are being closely co-directed by 10 other professors (including seven co-chairs) in Florida, France, and England. Sanjay Ranka is a Professor in the Department of Computer Information Science and Engineering at the University of Florida. His current research interests are energy efficient computing, high performance computing, data mining, and informatics. Most recently he was the Chief Technology Officer at Paramark where he developed real-time optimization software for optimizing marketing campaigns. Professor Ranka has also held tenured faculty positions at Syracuse University and as a researcher/visitor at IBM T.J. Watson Research Labs and Hitachi America Limited. Professor Ranka earned his Ph.D. in Computer Science from the University of Minnesota. He has coauthored two books: Elements of Neural Networks (MIT Press) and Hypercube Algorithms (Springer Verlag), 75 journal articles and 125 refereed conference articles. His recent work received a student best paper award at ACM-BCB 2010, best paper runner up award at KDD-2009, a nomination for the Robbins Prize for the best paper in journal of Physics in Medicine and Biology for 2008, and a best paper award at ICN 2007.
and Optimization. He is the associate Editor-in-Chief of the Journal of Parallel and Distributed Computing and an associate editor for IEEE Transactions on Parallel and Distributed Computing, IEEE Transactions on Computers, ACM/IEE Transactions on Computational Biology and Bioinformatics, Sustainable Computing: Systems and Informatics, Knowledge and Information Systems, and International Journal of Computing. He was a past member of the Parallel Compiler Runtime Consortium, the Message Passing Initiative Standards Committee, and Technical Committee on Parallel Processing. He is the program chair for 2013 ACM/IEEE International Parallel and Distributed Symposium, General chair for 2012 ACM Bioinformatics, Computational Biology and Biomedicine, and co-general chair for 2010 International Green Computing Conference. Dr. Nam-Ho Kim is presently the Associate Professor in the department of Mechanical and Aerospace Engineering at the University of Florida. He graduated with a Ph.D. in Mechanical Engineering from the University of Iowa in 1999 and worked at the Center for Computer-Aided Design as a postdoctoral associate until 2001. Since joining the University of Florida, he has led the Structural and Multidisciplinary Optimization group with Professor Raphael T. Haftka and advised 17 Ph.D. students and 14 M.S. students. Dr. Nam-Ho Kim’s research areas are structural design optimization, design sensitivity analysis, design under uncertainty, structural health monitoring, nonlinear structural mechanics, and structural-acoustics. He has been author and co-author of three textbooks and more than 100 journal articles and conference proceedings. His textbook on “Structural Sensitivity Analysis and Optimization” has been acknowledged as a landmark publication in the structural optimization community. He was also involved in the development of several commercial finite element analysis software, including NEi Nastran and MidasIT NFX. Dr. Kim is an associate fellow of the American Institute of Aeronautics and Astronautics. He is a member of the Editorial Boards of Structural and Multidisciplinary Optimization and International Journal of Reliability and Safety. Dr. Lam is an Associate Professor of Electrical and Computer Engineering at the University of Florida. He is the Associate Director of CHREC, the NSF Center for High-Performance Reconfigurable Computing and also serves as the Director of the undergraduate Computer Engineering program within the Herbert Wertheim College of Engineering at the University of Florida. Dr. Lam has over 25 years of research and development experience in the areas of distributed computing, serviceoriented computing, database management, and most recently reconfigurable computing (RC). He is the co-developer of the Novo-G reconfigurable supercomputer, the most powerful reconfigurable computer in the world. Novo-G serves as a testbed for the study of methods and tools for the acceleration and deployment of scientifically impactful applications on scalable RC systems. Dr. Lam has authored or co-authored over 100 refereed conference and journal articles and one textbook. He has also earned numerous teaching awards at the departmental, college, and university levels. For this past year, Dr. Lam has been active on program committees of numerous conferences, the most relevant to this project include the 2012 Symposium on Application Accelerators in High-Performance Computing (SAAHPC), the 2012 International Conference on ReConFigurable Computing and FPGAs (ReConFig12), and the International Workshop on Highly-Efficient Accelerators and Reconfigurable Technologies (HEART). He is a member of the editorial board of the International Journal of Business Process Integration and Management; and a reviewer for the ACM Transactions on Reconfigurable Technology and Systems and the International Journal of Reconfigurable Computing. Gregory Stitt is an assistant professor in the Department of Electrical and Computer Engineering at the University of Florida, where he started in 2007. He currently has over 50 publications in highly competitive journals and conferences on reconfigurable computing, high-performance computing, heterogeneous architectures, and dynamic optimizations for heterogeneous systems. He is a recipient of the NSF CAREER award. Stitt’s current work focuses on two main projects: elastic computing and FPGA virtualization. Elastic computing addresses application design complexity challenges associated with many-core, heterogeneous systems. Elastic computing provides optimization tools (e.g., compilers, synthesis tools, runtime optimizers) with a knowledge base of different implementations, optimizations, and parallelization strategies for different functions. This knowledge base enables massive design-space exploration that allows optimization tools to find significantly more efficient implementations for different runtime conditions such as numbers of available resources, input sizes, and power constraints. Elastic computing will be leveraged in the proposed project to optimize Compressible Multiphase Turbulence for exascale systems. FPGA virtualization focuses on eliminating productivity limitations of FPGAs by abstracting away fine-grained details of physical FPGAs. One significant problem is compilation times that currently take many hours to several days. Virtual FPGAs address this problem and provide compilation that is 1000x faster than FPGA vendor tools, while also enabling application portability across FPGAs. Such work will potentially be leveraged in the proposed project to assist with FPGA-based exascale emulation. Stitt has a strong record of recruiting talented domestic students for graduate school, and currently has seven domestic students funded from two NSF grants and from the NSF Center for High-Performance Reconfigurable Computing (CHREC). Dr. Thakur is currently an adjunct associate scientist at the Department of Mechanical and Aerospace Engineering at the University of Florida. He is also a co-founder and senior scientist at Streamline Numerics, a company specializing in software development and consulting in computational fluid dynamics (CFD). Dr. Thakur’s expertise is in the development of massively parallel CFD codes and their use in computation of unsteady compressible, turbulent flows for a variety of engineering applications. He has extensive experience in numerical development and multphysics modeling including Hybrid RANS-LES (HRLES) methods, turbulent combustion, cavitation, atomization, particle tracking, etc. He has been the principal investigator at Streamline Numerics for numerous SBIR and STTR awards from NASA, AFOSR and OSD (10 Phase 1, 5 Phase 2 and 10 Phase 3 projects) as well several federal agency grants at the University of Florida over the last decade. He has authored over 65 journal and conference papers and is a member of AIAA and ASME. As a Co-PI at this center, Dr. Thakur will focus on planning and execution of microscale simulations as well interfacing with the surrogate modeling effort. He will also be the Chief Software Architect. Dr. Thomas L. Jackson is Technical Manager of CCMT. Prior to his arrival at UF, he was a Research Professor in the Department of Aerospace Engineering (AE) and a Computational Science and Engineering Affiliate (CSE) at the University of Illinois at Urbana-Champaign. Dr. Jackson is also Chief Scientist and a founding member of Illinois-Rocstar LLC. He received his Ph.D. in Mathematics from Rensselaer Polytechnic Institute in 1985, after which he joined the staff of the Institute for Computer Applications in Science and Engineering (ICASE) where he had previously been a Graduate Research Assistant. In 1987 he became an Assistant, then (in 1992) an Associate, Professor at Old Dominion University in the Department of Mathematics and Statistics. In 1993 he returned to ICASE for five years before moving to the University of Illinois at Urbana-Champaign. He has co-edited two books, co-authored a textbook on hydrodynamic stability, and authored or co-authored more than 190 papers. He is currently a Fellow of APS, an Associate Fellow of AIAA, a member of the Combustion Institute, and a member of ASME. He has been a paper and grant referee for many organizations and journals, and is currently an Associate Editor for AIAA Journal. His expertise is in the area of basic fluid mechanics, combustion, stability, solid propellant combustion, energetic material modeling, particle packing, and the large-scale simulation thereof. Dr. Bertrand Rollin received his Ph.D. in Mechanical Engineering from the University of Vermont, studying the behavior of small scales of turbulence, and the interplay between passive scalar transport and flow topology. Upon completion of his Ph.D., Dr. Rollin joined Los Alamos National Laboratory as a postdoctoral research associate. His research led to the development of a model for Rayleigh-Taylor & Richtmyer-Meshkov instabilities and a new initialization strategy for RANS simulations of instability-driven turbulent material mixing. More recently, Dr. Rollin was a Research Faculty at the DoE PSAAP-II Center for Compressible Multiphase Turbulence (CCMT). As the leader of the Macroscale and Mesoscale simulations team, his research effort has focused on solving a problem of explosive dispersal of particles at an unprecedented level of details, thereby contributing to progress towards predictive simulation of multiphase flows under extreme conditions. Dr. Rollin’s research interests consist of the physics and computational modeling associated with turbulence, mixing, multiphase flows, compressible flows, and reactive flows. 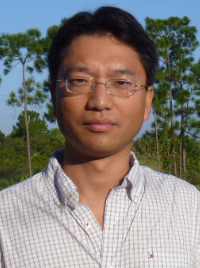 Dr. Zhang is an associate professor of Aerospace Engineering at Florida Institute of Technology. His main areas of research include computational fluid dynamics, multiphase flow modeling, solid rocket propulsion modeling, computational planetary science/astrophysics, and the large-scale simulation thereof. He obtained his Ph.D. in Aerospace Engineering in 2004 from the University of Texas at Austin. He then worked as a research associate at the DOE Center for Astrophysical Thermonuclear Flashes at the University of Chicago, where he conducted research on numerical study of thermonuclear flames in supernova. Prior to joining Florida Institute of Technology in 2011, Dr. Zhang worked as a research scientist, conducting research on combustion modeling for solid rocket motor at the DOE Center for Simulation of Advanced Rockets (CSAR), a Computational Science and Engineering Affiliate (CSE) at the University of Illinois at Urbana-Champaign. He is currently a senior member of American Institute of Aeronautics and Astronautics (AIAA) and a member of the Fluid Dynamics Technical Committee of AIAA. He is also a member of APS and ASME. Professor Adrian is a Regents’ Professor at Arizona State University and the Ira A. Fulton Professor of Mechanical and Aerospace Engineering in the ASU School for Engineering of Matter, Transport and Energy. He is Director of the Laboratory for Energetic Flow and Turbulence. He received his education at the University of Minnesota in mechanical engineering (1967, 1969) and a Ph.D. in physics from the University of Cambridge, (1972). Professor Adrian’s current interests are the development of experimental techniques that extend the range and power of particle image velocimetry and the study of turbulence behind fractal grids using these techniques. He also studies the three-dimensional structure of turbulence and its coherent organization in flow over surfaces in pipes, channels, and boundary layers using direct numerical simulations. He is a fellow of the American Physical Society, American Society of Mechanical Engineers, American Academy of Mechanics, and American Institute of Aeronautics and Astronautics, and became a member of the National Academy of Engineering in 1996. His work been recognized by awards of the APS Fluid Dynamics Prize, the AIAA Fluid Dynamics Award, ASME Fluids Engineering Award, the Leonard D’Vinci Award and the Asanuma Award of the Flow Visualization Society, and the Nusseldt-Reynolds Prize. In 2005, he was listed by ISI Web of Science as one of the 250 Most Highly Cited Researchers in Engineering. Before joining Arizona State University, Professor Adrian was the Hoeft Endowed Professor of Engineering and Interim Head of the Department of Theoretical and Applied Mechanics at the University of Illinois at Urbana-Champaign. There, he directed the Laboratory for Turbulence and Complex Flow and participated in the DOE ASAP Center for Simulation of Advanced Rockets. He has supervised the education and research of 5 Ph.D. students who were placed in NNSA labs. Dr. Fischer is a Blue Waters Professor in Computer Science and Mechanical Science and Engineering at the University of Illinois, Urbana-Champaign. Prior to joining the faculty at the University of Illinois, Dr. Fischer was a Senior Scientist in the Mathematics and Computer Science Division at Argonne National Laboratory, where he continues to hold a part-time appointment. Dr. Fischer is an internationally-recognized world leader in the area of development and peta-scale implementation of high-fidelity numerical approaches for the simulations of complex fluid flows. His book on High-Order Methods for Incompressible Fluid Flow (Cambridge University Press 2002) is the authoritative source on this subject. Dr. Fischer is a Senior Scientist in the Mathematics and Computer Science Division of Argonne National Laboratory and holds degrees in mechanical engineering from M.I.T. (Ph.D. 1989), Stanford (M.S. 1982), and Cornell (B.S. 1981). He did post-doctoral research in applied mathematics at Caltech, where he was the first recipient of the Center for Research in Parallel Computation prize fellowship. Prior to joining Argonne, Dr. Fischer was on the faculty of applied mathematics at Brown University. His work is primarily in the areas of computational fluid dynamics, spectral methods, iterative methods, and large-scale parallel algorithms. Dr. Fischer is a recipient of the Gordon Bell Prize for high-performance computing and has published over 100 articles in this area. He wrote the first commercially available software for distributed memory parallel computers. His open source spectral element code, Nek5000, is used for fluid dynamics and combustion simulation by more than 160 researchers worldwide and has scaled to over one million processes. Dr. Fischer’s expertise in spectral element methodology and his experience in peta-scale computation will be an invaluable asset to the center. Dr. Fischer and S. Balachandar have worked together for over 12 years on turbulent multiphase flows and jointly supervised two doctoral students. Dr. Fischer will participate in the development of multi-element compressible multiphase turbulence code CMT-Nek, with adaptive element refinement and its implementation on exascale platform. Dr. Scott Parker is a staff member at the Argonne Leadership Computing Division of Argonne National Laboratory. His expertise is in the areas of high performance computing architecture, performance measurement, performance analysis, performance prediction, and spectral element methods. He holds degrees in mechanical engineering from the University of Illinois at Urbana-Champaign (Ph.D. 2001) and Lehigh University (B.S 1993). Prior to joining Argonne he worked in high performance computing at the National Center for Supercomputing Applications at the University of Illinois. His work included the development, acquisition, and deployment of high performance computing systems, three of which have ranked in the top five of the world’s most powerful computing systems, including the 10 peta-flop Blue Gene/Q system recently deployed at Argonne National Lab. Additionally ,he works on high performance peta-scale scale simulations, including some of the largest spectral element simulations performed to date. Dr. Parker is currently participating in investigations of exa-scale architecture designs and the development of exa-scale spectral element solvers. Dr. Charles M. Jenkins is a research chemical engineer at the Air Force Research Laboratory (AFRL) Damage Mechanisms Branch at Eglin Air Force Base, Florida. He gained experience as a systems engineer and program manager for advance development and program management in multiple munitions programs spanning hardware and software design over the last 29 years at Eglin AFB and 5 years in industry. Dr. Jenkins’ expertise is in energetic materials and multiphase flow, and will be conducting supportive experiments for computational model verification for the proposed center. He has previously conducted multiphase experiments under support from the Defense Treat Reduction Agency (DTRA) and is currently conducting experiments with spherical dispersal of energetic particles and directional multiphase flow from cylindrical converging shock systems. His analysis for these experiments has used computation models for support and prediction of particle velocity, concentration, and shock interaction. He is a member of the American Physical Society. Dr. Jenkins received his Ph.D. from the University of Florida in Environmental Engineering specializing in Aerosol Science, ME from the University of South Florida in Environmental Engineering, MS in Aeronautical and Aerospace Science from Embry-Riddle Aeronautical University and a BS in Chemical Engineering from the University of South Alabama. As an experimenter for the planned center, he will focus on the setup and capture of experimental data using particle image velocimetry, x-ray, and high speed photography at AFRL test site. He will also be involved with the analysis and public release approval of the data to the proposed center at the University of Florida. Mr. Littrell is an internationally-recognized leader in designing and conducting controlled experiments of explosive blasts and using the blasts for the dispersal of liner elements and embedded particles. He has developed novel x-ray and high-speed camera-based techniques for obtaining validation-quality measurements under extreme conditions. He is a Senior Engineer at the Air Force Research Laboratory, Munitions Directorate, Eglin Air Force Base, Florida, with 26 years experience in ordnance research. He received a Masters degree in Chemical Engineering from Auburn University in 1986. He currently works at the Advanced Warheads Experimentation Facility (AWEF) developing warhead technologies, diagnostics, and analysis methods. His research interests include multiphase blast, directional fragmentation and fragmentation control, electromagnetic effects on energetic materials, structural energetic materials, defeat mechanisms for chemical and biological targets, and selectable effects using novel energetic materials and initiation techniques. He has authored over 85 papers, proceedings, and technical reports on these topics. He has received the Exemplary Civilian Service Award and the Armament Directorate’s Science & Technical Achievement of the Year Award twice. The proposed validation experiments will be performed by University of Florida Research Scientists, Post Doctoral and graduate students at the AWEF at Eglin Air Force Base, with active participation and guidance from Mr. Littrell. Professor Adrian will also participate in design and execution of validation-quality diagnostic measurements.